Groundhogs, also known as woodchucks, can be a real nuisance in your yard. That can destroy your garden and their holes can ruin your lawn. This is a guide about getting rid of groundhogs. Here's what we do to drive groundhogs away from structures (house, shed, propane tank, etc. ): Dump dirty kitty litter into the hole. 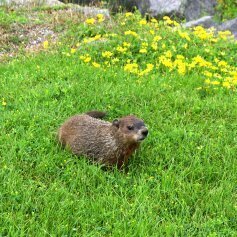 The groundhog leaves the area for sweeter smelling options and no critter is harmed! Try it! My neighbor has a wood pile on pallets that this very large ground hog lives under. This ground hog is eating my flowers all the time. He especially likes marigolds. I need to get rid of it with out a whole lot of expense. Well you could trap the critter in a hav a heart trap and relocate him to another location. They sell them at hardware stores and the trap needed for a ground hog would cost about $50. Or maybe getting rid of the pile of pallets may also help. Of course someone will suggest mothballs that are useless. Ground hogs are too smart to go into traps. We have serious groundhog problem. I have seen solutions suggesting ammonia rags, used cat litter, etc. I am not sure if this will work with our pests, as they have burrowed into our sand mound septic system. There are huge burrows. Help please! From your description, you have much more than a DIY groundhog problem! I suggest a pest removal company ASAP as they may have already damaged your septic system. Try using Juicy fruit gum. You chew it just until soft. Poke a hole in their run or hole and drop in. They are lured by the scent.They eat it and can't digest the gum so it kills them. You can also use caster oil poured into the run or even spread around and down the hole. They don't like the smell and leave. This also works for moles. I'm pretty sure the gum thing is an old wives' tale. Humans can't digest gum either, but it just passes through our systems undigested. Will throwing mothballs down the hole chase them out? Some people put a lot of faith in mothballs. I don't. The critters either move them or just go around them. I think I would buy a have-a-heart trap. When you have them in the trap take them for a ride about 10 miles and release them. I don't have ground hogs but I do that with other critters on my property. I can't get rid of them completely but I can controll the population. With 290 acres of woods behind my property it is impossible. Put a T-post in the ground tie on a string and something that will bang against the post when the wind blows, like a tin can or pop can- moles and shrews don't like vibrations. I found that out from an elderly man at a nursing home who used to farm ground all over Bee, Nebraska he was a very successful farmer. he said that when he was a kid his dad gave him a penny for each mole hole he could rid the mole from. Back in the olden days a penny could buy a 3 pieces of candy! How do I deter a pair of groundhogs that are living under my shed? I don't want to trap and release them, nor do I want anyone to kill them. Is there anything I can throw down into their hole to make them relocate? You're going to think this is crazy but, go to a store like Big R, Rural king, etc. that sells hunting supplies. Buy a bottle of fox urine. Take it home a put on some cotton balls and place inside a knee hi pantyhose or something like that. I suppose a pillow case or even on an old rag would work. Put whatever you put the fox urine on in the hole or around where the groundhog are. They will leave. We did this ourselves when we had a groundhog under the concrete in one of our outbuildings. He left and has never been back. They are scared of foxes! The item was less than $10. I found this somewhere on the internet. Hope it helps you. We have used this method and it works, hope you have a cat or know someone that does! After locating their holes, they may have 3 holes,dump a box of used kitty litter in the hole and cover with something heavy like a patio block. The critters will move on to better digs. unfortunately killing them is the only solution. A hound dog or border collie or lab should be able to kill them for you or shoot them. There is no other solution to get rid of them which is sad because they are cute and furry and just trying to eat. How would I get rid of a groundhog that lives in my basement? Go to your local barber or hairdresser and ask them for the clippings from when they do hair cuts. Spread this around in your basement and the critter should leave immediately going out the same way it came in. 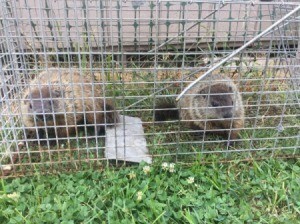 We use this method around our storage building from time to time and we no longer have any groundhogs living under it. Hope this helps. Mouse or rat poison, perhaps? How can I get rid of ground hogs? I have a family of 4 under my shed. I haven't actually tried this, but I've heard that some wild critters will move away if you play loud obnoxious music near them. Of course it may also be hard on you and your neighbors, and unless there is a way to block up entrances, they may return. I am looking for a home remedy to get rid of groundhogs. They ate all my parsley and lettuce. I've tried the things that they sell at the store; it didn't work. I hope someone can help me. Thank you. Okay, as a vetern of many groundhog invasions I can offer some advice. However, I am sorry to say that the best way to stop a gourndhog is to remopve it from your property, either humanely or not. These animals do not share or stop feeding. 1. Fence the garden, dig down about a foot to bury the fence to discourage the citter. You may also consider electric fence, a string about 2 inches above the ground gives a shock to the nose that won't wound, but still trains them to stay away. 2. Black pepper, ground up and sprinkled liberally. The smell can make some animals sneeze which they dislike. Red pepper flakes work for more persistent animals, but this must be reapplied after rain. 3. Have your dog or a friend's dog wander round the garden at least once a week. The smell of a predator will often discourage the groundhog. These are techniques that I've used successfully in the past, sadly though some groundhogs will go to great lengths to eat your garden. 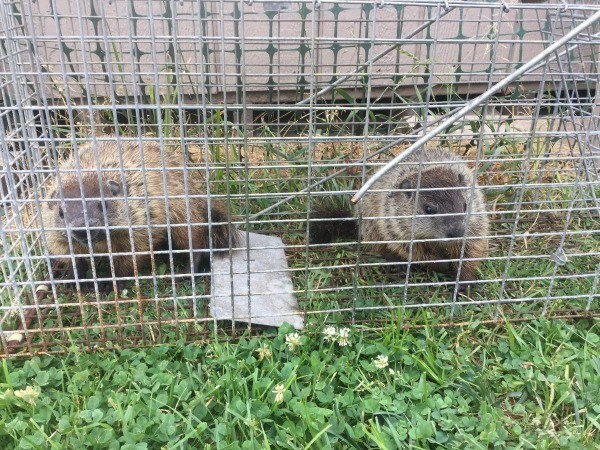 I've dealt with groundhogs/woodchucks for years, and the only thing that worked for me was to remove them from the property like the previous poster stated, then I made sure where they were living was covered with chicken wire, so no new ones could move back in. They usually eat within a short distance of where they are living, so I'd suggest figuring out where that is, then set up a live trap in front of the hole they have dug. Generally they are living under a shed, garage, porch, deck, something like that where they can dig under it pretty easily. Once you are sure that you've caught them all, staple chicken wire to the base of each outbuilding on your property, lift the sod in front of it, about a foot, then lay the chicken wire under the sod. This will prevent them from digging close to the building. I have never found peppers or repellants to work, and you have to be careful what you use around food crops. Fencing your garden would work, if you can prevent them from digging under the fence. Good luck! How do I keep groundhogs from eating my sunflowers? We have pocket gophers where I live. I'm not sure if this will work for groundhogs because they tend to come outside more. Are they eating the roots or the stems? But I bought this thing called a mole chaser. It's like a metal windmind looking thing. You put it on a metal hollow pole in the ground. It vibrates the ground and the underground critters don't like it. I have a big garden and one mole chaser right in the center works to keep those pocket gophers at bay. FYI- The sonic sound things don't work. I would like to know how to keep woodchucks out of my garden. How do I get rid of woodchucks in my yard? You can use gas cartridges to kill them. You can fence an area to keep them out of a garden or other area, but you can only use certain types of fence at least a certain height and buried a certain depth in the ground. I have a fenced-in garden, but still the woodchucks are finding their way into my garden by climbing over the fence. Does anyone have any suggestions for keeping these animals away from my vegetables? I would hate to give up gardening because of these critters. I use fox urine. You can buy it at a hunting/camping store. I soak cotton balls in it and drop it in their hole. I also sprinkle it in the dirt around the perimeter of my fence. I have gone as far as taking dog hair and feces and soaking those, too. Groundhogs are persistent. Beware, use double gloves when handling the fox urine and don't get it on your clothes, it reeks and won't come out. Does anyone have a way to get rid of groundhogs from the garden? Is there a solution I can mix to keep them out? HELP! They're eating up all my garden!